Now I’ve got a few larger challenges under my belt, I decided to scale things down a bit and returned to the kitchen for the next one. I’ve made creme bruleé and macaron on the challenge already, but it was time for something savoury. Something that I’ve never cooked before, obviously. 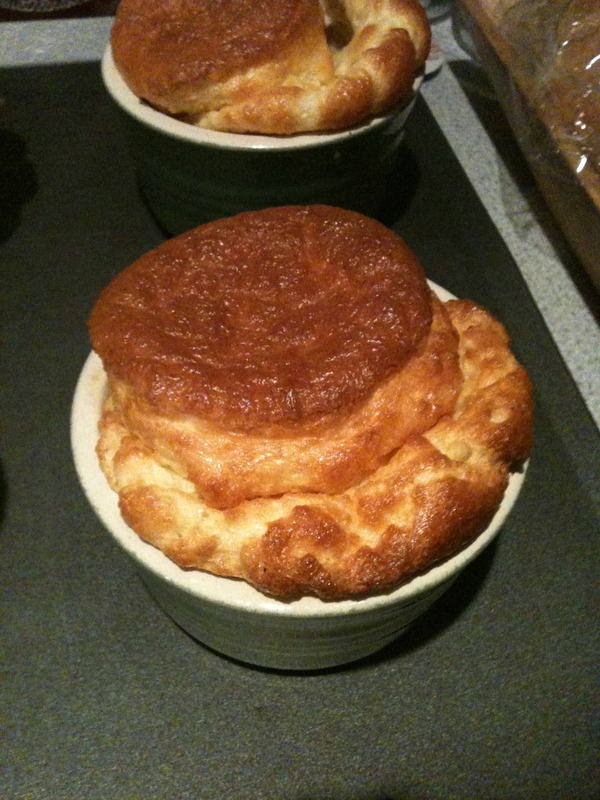 Cheese soufflé. In fact, I’d never even eaten any kind of soufflé for that matter but the point of the exercise was firstly to see if I could make it rise like it should and then eat it! This isn’t to say that she’s my favourite food writer. That title belongs now and always to Nigel Slater. His writing is wonderful and his books are exquisite. I generally have one of them by my bedside and I try to keep them in good condition, especially the two volumes making up ‘Tender’, which are my favourite cookbooks of all time. Having said that, some of my older Nigel Slater books are stuck up with splatters from cooking, which is a good sign – one that it’s been well-used. My rather ridiculous cook book collection also contains Simon Hopkinson, Sarah Raven, Elisa Beynon, Nigella Lawson, Elizabeth David, Julia Child and many more…I could spend a fortune on cook books and have only just got into the habit of getting books out of the library otherwise the house would be over-run with them. There’s something wonderfully comforting about reading a cookbook, even if you only ever make beans on toast. Anyway, the simple truth about Delia Smith though, is that there is no-one better at teaching you the basics. The ones that you would already know if you’d actually listened to what your mother was trying to teach you when you were younger. So, although my mother is the reason I can make a cake without needing a recipe book, make béchamel sauce from scratch and whip up a decent pancake batter (thanks Mum!) when there are things of this kind that I don’t know, Delia provides the information. ‘Delia’s Complete Cookery Course’, bought from a charity shop for 50p, is the source of all this information, and is probably my best charity shop buy ever. So, on Sunday, using some amazing Wyfe of Bath cheese, bought especially from Abel and Cole for the purpose of this challenge, I made four cheese soufflés. I used my second best ever charity shop bargain, Le Creuset ceramic dishes (50p for four!) to cook them in.